Fractional CO2 provides wrinkle reduction, overall tissue tightening and textural improvement. The skin will have a Smoother, tighter texture while decreasing pigmentation problems. The laser treatment is done in the office and requires 5 days of downtime. Most patients look and feel as if they have sunburn for several days. 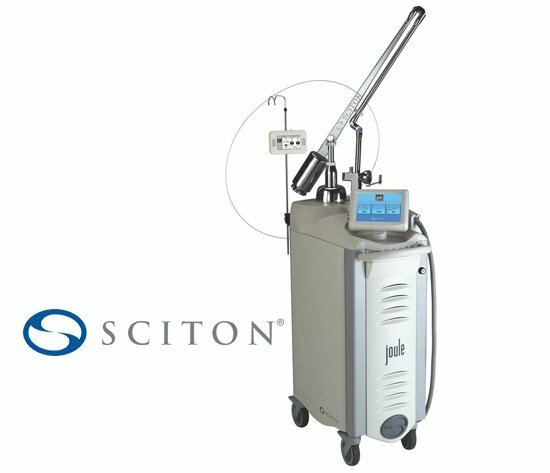 To obtain optimal results sometimes it is required to have multiple laser treatments. To learn more about this procedure and Dr. Burke, click here. Wrinkle fillers like Juvéderm® and Radiesse® are injections that are useful means of improving specific wrinkles and scars. They can be used to refine the improvements from other cosmetic procedures. BOTOX is most helpful in improving vertical furrows between eyebrows whereas Juvederm and Radiesse are used to fill out small skin surface defects, as well as, the creases around the lips. Multiple treatments may be necessary over time since the filler gradually absorbs into the tissue and its effect disappears. This treatment provides improvement in about eighty percent of patients and is done in the office with local anesthesia. You can resume full activities immediately after the injection. BOTOX is a medication which is injected directly into the muscles to weaken the activity of the muscle. This in turn will result in a smoother appearance on the skin surface. The duration of the effect from BOTOX varies from individual to individual but is usually in the range of three to four months. The treatment can be repeated as often as desired. There is no restriction on activities following BOTOX treatments. To learn more about this procedure and Dr. Burke, click here. JUVÉDERM® Ultra XC – Focuses on nasolabial folds and wrinkles around the nose and mouth. JUVÉDERM VOLUMA® XC – Focuses on adding lift and contour to the cheeks. For more information on Dr. Burke and fillers click here. A procedure that has been used successfully for years to heal sports injuries is becoming the treatment of choice to improve the appearance of wrinkles, scars, sun damage and even dark circles under the eyes. It is popular because of its organic nature. Plasma taken from the patient’s own blood is injected into the body. The possibility of side effects/adverse reactions is practically nonexistent. The treatment has become popularly known as the Platelet-Rich Plasma Facelift. Kybella® is an FDA-approved injectable treatment that destroys fat cells under the chin to improve your profile. Once the fat cells are destroyed they can no longer store or accumulate fat so further treatment is not expected to be needed once the desired aesthetic goal is achieved. There are a variety of techniques which may be used to improve the appearance of scars. The overall goal of improvement is to minimize the appearance of the scars. You must realize that it is not ever possible to completely remove all traces of a scar since the body can only heal by forming a new scar. Thus the goal of scar revision and dermabrasion is to render a scar less conspicuous. Scar revision is done either in the office setting or in an outpatient surgery setting. Healing generally takes several days and there usually is minimal restriction on activities. On occasion a scar revision surgery is combined with dermabrasion in a staged fashion to achieve the best results possible. Dermabrasion is an excellent means of providing overall improvement in acne scarring. The scarring cannot be completely removed, but when combined with other minor procedures dermabrasion can provide excellent smoothing of noticeable acne defects. The acne itself must be inactive prior to dermabrasion. To learn more about this procedure and Dr. Burke, click here. How Can a Deviated Septum Interfere With My Sinuses?